Since 1922 the Bartolucci Family has consistently created a perfect marriage of grapes and wine at Madonna Estate. Located in the world-renowned Carneros region, an area known for its fertile lands and cool climate, the Bartolucci family has found success with their organically grown grapes and Estate Bottled wines. In addition to practicing natural farming methods, they also combine traditional and modern winemaking techniques. As the second oldest winemaking family in the Napa Valley, it is important to them that they continue the commitment to farm naturally and preserve the winemaking traditions of past generations. Our Tasting Room reflects our Italian heritage. The decor is in the style of Pompeii. We have a friendly, knowledgeable staff, that are comfortable speaking to groups of any size. Mementos and gifts are also available in the tasting room. 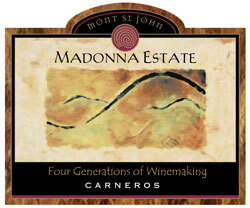 To join the wine club, visit www.madonnaestate.com or call 707-255-8864. No membership fee to join, immediate membership benefits upon signing, two, four or six estate bottled wines four times a year, club shipments are discounted up to 35% off retail price, 20% discount off all wine purchases (including reserves), first to taste and purchase Madonna Estate new releases, complimentary tasting for you and two of guests, complimentary use (by reservation) of our vine shaded picnic area, private tours (by appointment) of the winery and/or vineyard. 1. Napa residents only. Guests must pay standard tasting fees. 2. By appointment. 3. Neighbors are welcome Monday through Thursday except Holidays. 4. 10% discount on the purchases of three or more bottles of wine. 5. Call for clarification if needed at 707.255.8864. Madonna Estate is certified under the Napa Green Winery Program by the Napa County Department of Environmental Management (DEM) and the Association of Bay Area Government’s (ABAG) Green Business Program and completed all the regulatory components needed for environmental sustainability. These components included developing water and energy conservation methods, preventing pollution, and reducing solid waste. In addition to developing sustainable winery practices, this program is set to become the standard for the state of California. Madonna Estate is certified under the Napa Green Certified Land Program. Madonna Estate has created and implemented a customized farm plan with measured results that addressed all aspects of its property, vineyard land as well as non-farmed land, including practicing soil conservation, water conservation, stable drainage, riparian corridor enhancement, fisheries and wildlife habitat enhancement and long-term improvement and sustainability.